Genetic-modification of food should be avoided at all costs. Genetic engineering, also known as genetic-modification or manipulation (GM), is a form of biotechnology that allows scientists to move genes between different species. Using various laboratory techniques, scientists can create life forms that could not occur naturally. In the genetic-modification or the genetic engineering of food, these techniques are used to make crop plants grow differently. The resulting life forms are often known as genetically modified organisms (GMOs). Currently, genetic engineering or genetic modification is mainly used to produce two types of crops. 1. Herbicide-tolerant crops: these are genetically engineered to resist herbicides that farmers spray on the crop to kill weeds, and represent 80% of GE crops. 2. Bt crops: these are genetically engineered to produce their own pesticide to kill certain insect pests and represent 20% of GE crops. 'STOP PRESS': New evidence reveals Monsanto's Roundup may threaten global food supply. It is worth reading this article by Anthony Gucciardi, health activist and wellness researcher. We need to know what is going on with our food supply. Genetically Engineered Crops in Agriculture. Monsanto Declared Worst Company of 2011 by Natural Society for threatening both human health and the environment. According to a recent report, GM crops are costing Australian farmers big dollars - whether they choose to grow them or not. Quintin Willmott in Victoria has grown GM canola for the first time and, a few weeks ago, said it would be his last. The crop behaved unpredictably, costing him an estimated $30,000. Today, WA organic farmer Steve Marsh revealed that two-thirds of his farmland is contaminated by someone’s GM canola crop. The canola travelled at least 1.5 km and contaminated 220 hectares. Marsh could also potentially suffer huge financial losses, as Australian organic standards don’t accept any GM presence. He is considering legal action, which would be the first case of its kind in Australia. The WA Government showed its bias to the GM industry when the agriculture minister, in response to Marsh, stated that zero percent thresholds are “unrealistic”. Organic certifier, the National Association of Sustainable Agriculture Australia (NASAA), is conducting an official investigation. The following article spells out very clearly why we should avoid GM food. I feel very strongly about the introduction of genetic modification to our crops and I think everyone should be aware of the dangers. If we destroy nature there will be no life for future generations, so please avoid GM food. Robyn, mother of four, was shaken awake by the dangerous allergic reaction of one of her children to a "typical" breakfast. Her mission to unearth the cause revealed more about the food industry than she could stomach... view the video here..
See also my previous page about soil health. Would you knowingly buy GMOs? You can take part in a GMO Awareness Campaign to target the issue of labelling of GMO products thus ensuring we have a choice. Find out how you can help or click "Like" on this Facebook page. On May 19th, the American Academy of Environmental Medicine (AAEM) called on "Physicians to educate their patients, the medical community, and the public to avoid GM (genetically modified) foods when possible and provide educational materials concerning GM foods and health risks." They called for a moratorium on GM foods, long-term independent studies, and labeling. AAEM’s position paper stated, "Several animal studies indicate serious health risks associated with GM food," including infertility, immune problems, accelerated aging, insulin regulation, and changes in major organs and the gastrointestinal system. They conclude, "There is more than a casual association between GM foods and adverse health effects. There is causation," as defined by recognized scientific criteria. "The strength of association and consistency between GM foods and disease is confirmed in several animal studies." More and more doctors are already prescribing GM-free diets. Dr. Amy Dean, a Michigan internal medicine specialist, and board member of AAEM says, "I strongly recommend patients eat strictly non-genetically modified foods." Ohio allergist Dr. John Boyles says "I used to test for soy allergies all the time, but now that soy is genetically engineered, it is so dangerous that I tell people never to eat it." Dr. Jennifer Armstrong, President of AAEM, says, "Physicians are probably seeing the effects in their patients, but need to know how to ask the right questions." World renowned biologist Pushpa M. Bhargava goes one step further. After reviewing more than 600 scientific journals, he concludes that genetically modified organisms (GMOs) are a major contributor to the sharply deteriorating health of Americans. Among the population, biologist David Schubert of the Salk Institute warns that "children are the most likely to be adversely effected by toxins and other dietary problems" related to GM foods. He says without adequate studies, the children become "the experimental animals." The exact same symptoms are now being reported by farm workers throughout India, from handling Bt cotton. In 2008, based on medical records, the Sunday India reported, "Victims of itching have increased massively this year . . . related to BT cotton farming." AAEM states, "Multiple animal studies show significant immune dysregulation," including increase in cytokines, which are "associated with asthma, allergy, and inflammation"—all on the rise in the US. According to GM food safety expert Dr. Arpad Pusztai, changes in the immune status of GM animals are "a consistent feature of all the studies." Even Monsanto’s own research showed significant immune system changes in rats fed Bt corn. A November 2008 by the Italian government also found that mice have an immune reaction to Bt corn. In India, animals graze on cotton plants after harvest. But when shepherds let sheep graze on Bt cotton plants, thousands died. Post mortems showed severe irritation and black patches in both intestines and liver (as well as enlarged bile ducts). Investigators said preliminary evidence "strongly suggests that the sheep mortality was due to a toxin. . . . most probably Bt-toxin." In a small follow-up feeding study by the Deccan Development Society, all sheep fed Bt cotton plants died within 30 days; those that grazed on natural cotton plants remained healthy. AAEM states, "GM foods have not been properly tested" and "pose a serious health risk." Not a single human clinical trial on GMOs has been published. A 2007 review of published scientific literature on the "potential toxic effects/health risks of GM plants" revealed "that experimental data are very scarce." The author concludes his review by asking, "Where is the scientific evidence showing that GM plants/food are toxicologically safe, as assumed by the biotechnology companies?" Famed Canadian geneticist David Suzuki answers, "The experiments simply haven’t been done and we now have become the guinea pigs." He adds, "Anyone that says, 'Oh, we know that this is perfectly safe,' I say is either unbelievably stupid or deliberately lying." Dr. Schubert points out, "If there are problems, we will probably never know because the cause will not be traceable and many diseases take a very long time to develop." If GMOs happen to cause immediate and acute symptoms with a unique signature, perhaps then we might have a chance to trace the cause. This is precisely what happened during a US epidemic in the late 1980s. The disease was fast acting, deadly, and caused a unique measurable change in the blood — but it still took more than four years to identify that an epidemic was even occurring. By then it had killed about 100 Americans and caused 5,000-10,000 people to fall sick or become permanently disabled. It was caused by a genetically engineered brand of a food supplement called L-tryptophan. To help identify if GMOs are causing harm, the AAEM asks their "members, the medical community, and the independent scientific community to gather case studies potentially related to GM food consumption and health effects, begin epidemiological research to investigate the role of GM foods on human health, and conduct safe methods of determining the effect of GM foods on human health." Citizens need not wait for the results before taking the doctors advice to avoid GM foods. People can stay away from anything with soy or corn derivatives, cottonseed and canola oil, and sugar from GM sugar beets — unless it says organic or "non-GMO." There is a pocket Non-GMO Shopping Guide, co-produced by the Institute for Responsible Technology and the Center for Food Safety, which is available as a download, as well as in natural food stores and in many doctors’ offices. If even a small percentage of people choose non-GMO brands, the food industry will likely respond as they did in Europe — by removing all GM ingredients. Thus, AAEM’s non-GMO prescription may be a watershed for the US food supply. 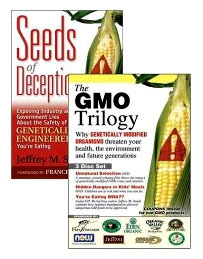 International bestselling author and independent filmmaker Jeffrey M. Smith is the Executive Director of the Institute for Responsible Technology and the leading spokesperson on the health dangers of GMOs. His first book, Seeds of Deception is the world’s bestselling book on the subject. His second, Genetic Roulette: The Documented Health Risks of Genetically Engineered Foods, identifies 65 risks of GMOs and demonstrates how superficial government approvals are not competent to find most of them. He invited the biotech industry to respond in writing with evidence to counter each risk, but correctly predicted that they would refuse, since they don’t have the data to show that their products are safe. These books are available for purchase - they make excellent reading - just click on the relevant image. See L Zolla, et al, "Proteomics as a complementary tool for identifying unintended side effects occurring in transgenic maize seeds as a result of genetic modifications," J Proteome Res. 2008 May;7(5):1850-61; Hye-Yung Yum, Soo-Young Lee, Kyung-Eun Lee, Myung-Hyun Sohn, Kyu-Earn Kim, "Genetically Modified and Wild Soybeans: An immunologic comparison," Allergy and Asthma Proceedings 26, no. 3 (May–June 2005): 210-216(7); and Gendel, "The use of amino acid sequence alignments to assess potential allergenicity of proteins used in genetically modified foods," Advances in Food and Nutrition Research 42 (1998), 45–62. Hye-Yung Yum, Soo-Young Lee, Kyung-Eun Lee, Myung-Hyun Sohn, Kyu-Earn Kim, "Genetically Modified and Wild Soybeans: An immunologic comparison," Allergy and Asthma Proceedings 26, no. 3 (May–June 2005): 210-216(7). Netherwood et al, "Assessing the survival of transgenic plant DNA in the human gastrointestinal tract," Nature Biotechnology 22 (2004): 2. Angela Hall, "Suzuki warns against hastily accepting GMOs", The Leader-Post (Canada), 26 April 2005. Find out more about the genetic-modification of our crops and how to ensure that we have healthy soil so that we can grow healthy food.